A Somali giraffe born Nov. 27, stands in front of its mother in the Cologne zoo on Thursday. Giraffes are undergoing a 'silent extinction,' two biologists say. 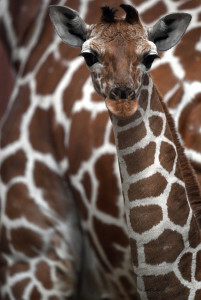 A Somali giraffe born Nov. 27, stands in front of its mother in the Cologne zoo on Thursday. Giraffes are undergoing a ‘silent extinction,’ two biologists say.